Self-driving cars are definitely in our future. Some states–Nevada, Florida, Michigan, California–and Washington, D.C. are already allowing them on their streets (at least for testing purposes) and a number of others are considering doing the the same. Though the road to a hands-free life has been paved, the future of it all is still up in the air. What would allowing self-driving cars on the road en masse mean for our safety? How will we communicate our needs to them? In what ways will they change how we live day to day? And can they enrich our lives? International design group and think tank IDEO wants to explore what this new technology could mean for urban life over the next 15 years. 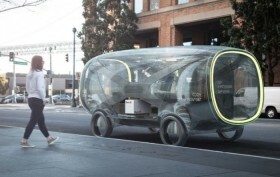 With their study “The Future of Automobility” they offer up a wildly vibrant vision through three concepts grounded in the use of autonomous vehicles.